At the beginning of 2018 I was little more than a beginner when it comes to soaring. Although I had first learned to fly gliders all the way back in 1983, I had not flown at all for 30 years. I had only recently started all over again when I regained my glider pilot’s license in Austria in June 2017, followed by a US glider certificate in August 2017. By the end of 2017 I had still less than 100 hours as pilot in command. My goal for 2018 was to pull myself out of the beginner category, develop my skills, and advance to intermediate soaring pilot. Below are some of the highlights of my soaring year. The first opportunity to learn came early in January when the combination of westerly winds flowing over the Continental Divide and a stable air mass conjured oscillating mountain waves, beautifully marked by long lines of rotor clouds, thanks to just the right level of moisture content. After releasing from tow at just 7,900 feet, I climbed through 17,000 feet 15 minutes later, and was able to practice transitioning between wave bars upwind and downwind. The arrival of Spring promised longer days, more sunshine, and thermals. Ironically, my first thermal flight of the year was under mostly overcast skies. But the day was characterized by a highly unstable air mass, which, although prone to early over-development, generated thermal updrafts very quickly and easily. I kept heading for spots where the sun had just penetrated the clouds even if it was just for 10 to 15 minutes, and often this was enough to break another thermal off the ground. Although I couldn’t go very far, the rising air kept me up and interested for about three hours. Spring time is fickle in Colorado and the winter can be difficult to shake off. And so April brought back the opportunity for another late-season wave flight, which turned out to become the flight with the highest average speed for the day on OLC worldwide. I had not even tried to go fast but flying in strong wave lift along a long mountain range basically forces you to maintain a straight course and you have to put the nose down and speed up simply to stay below Class A airspace. The result was a 325 kilometer flight with an average speed of 152 kph (82kts). April 4 – The sky was not be screaming “wave” but the lift was strong, inducing me to fly the fastest flight on OLC worldwide for the day. The Soaring Society of Boulder is one of the most successful clubs in the annual OLC Speed League competition in the United States, and I felt compelled to test my skills on the first Speed League Weekend. It was a challenging day with weak thermal lift over the foothills and a strong inversion over the prairie. A convergence line sat almost on top of the Continental Divide, promising better lift further west but I was unable to reach it. I ended up scratching along in weak lift over the foothills between 500 and 1000 ft AGL, resulting in a 150km flight with an average speed of just 42.6 kph. Not good enough but a worthy attempt. On May 20, I ventured for the first time beyond gliding range of any airport by flying into South Park and getting within 20 miles of Pike’s Peak. It’s a strange sensation when you realize that you are truly dependent on the elements and your skills to interpret and use them to your advantage. There were also other great lessons for me in this flight such as speeding along under a cloud street for 30 miles at 220 kph, and really learning to understand the significance of the convergence line that so often characterizes the soaring conditions along the Continental Divide. Another strong convergence line day allowed me to plan and execute a speed run along the foothills and fly a pre-declared 300 km triangle, thus earning Diamond Goal in 2 hours and 34 minutes. The flight was also the fastest from Boulder for the day, earning 118 points for the OLC Speed League. June 25 – Diamond Goal in 2 hrs 34 min. The red line shows the flight track on task, following the convergence line. August took us to Europe to visit family and friends. By this time of the year the local peak soaring season is usually coming to an end, and I knew I had to take the first opportunity if I wanted to do some cross-country flying. That chance came on August 4 when I was able to fly my first pre-declared 300 km triangle in the Alps, taking me along the main spine of the Alps, soaring “from bone to bone”. As expected, soaring conditions deteriorated throughout August but that gave me the opportunity to add a self-starter endorsement to my Austrian glider pilot’s license. And, occasionally, I still found the opportunity for a nice soaring flight, even when conditions had become challenging. One of the great attractions of soaring is that the learning never ends. The weather phenomena that enable us to soar are extremely complex and forever changing. Reading the sun, the ground, and the sky and anticipating what will happen in the next 10 minutes, in the next hour, and in the next 3-5 hours is a constant challenge. Deciphering how it will affect the movement of air currents and the location of the best lines of lift is an even greater puzzle. I have definitely made progress in 2018 but I am also well aware of how little I still know. Which only makes me look forward to the 2019 soaring season. Low And Slow – But These Views! August 12 was my second day flying in the Alps this year. The forecast conditions were rather poor, which surprised me because a cold front had passed through the day before, finally putting an end to the oppressive heat wave that had lasted for more than three weeks. 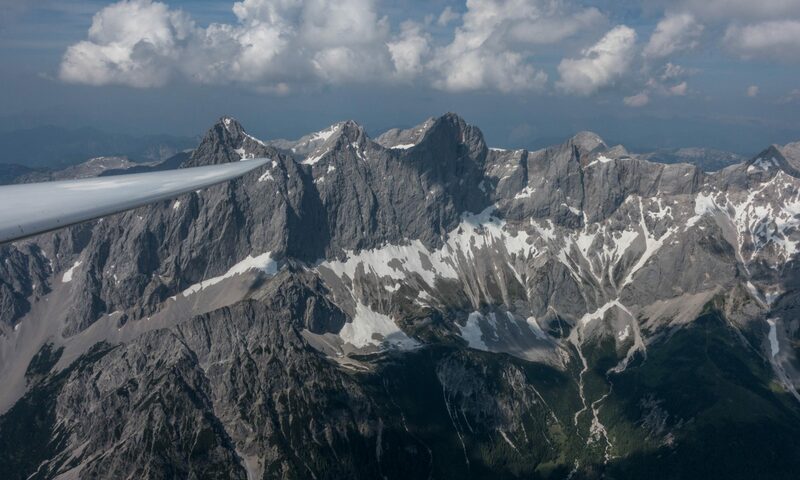 Post-frontal weather often offers good soaring in the Austrian Alps. Intimidating mountains in western Austria, south of Zell am See. Note: I did not take any pictures during the first 2 hours of the flight: I was way too busy trying to make progress while looking for weak lift just a few hundred feet above the ridges. Conditions improved drastically after 2PM. The local forecast from AlpTherm predicted weak (“schwach”) climb rates around 1 meter/second (2kts) with thermals up to 3,000m (10,000 feet). SkySight was more encouraging, indicating a potential flight distance of 400-500km (in an 18m ship) supported by a long soaring day starting as early at 10am, 1.5 – 2 m/s thermals, nice cumulus clouds, no OD, no storms, and no significant high-cloud obstruction. Light southerly winds would contribute to dense clouds stacking up on the south side of the Alps’s main spine, but were likely too weak to be usable for ridge soaring. SkySight projected even lower cloud bases than AlpTherm at the east side of my soaring area – as low as 2,400m (8,000 feet) – yet gradually rising to 3,300m (11,000 feet) further west. Potential flight distance of 400-500km within the soaring area along the Salzach and Enns Valleys. My drive to the airport started at the southern side of the Alps under a layer of dense clouds. As I crossed to the north at Wald am Schoberpass, the clouds gave way to deep blue skies. The air was also much clearer than in recent days: obviously the cold front had removed the inversion layer. A few low-hanging clouds clang to the slopes of the mountains, remnants of the moisture that the heavy rains of the passing cold front had left behind. There was no doubt that the sun would quickly dissolve them. Dark red colors show dense cloud coverage forecast south of the Alp’s main spine. Nice cumulus clouds were projected to mark the lift within my soaring area. By 10:30am the first new wisps started to form above the hills, indicating that lift was already starting to form. I moved the glider out onto the grid at Runway 04 while the air on the ground was perfectly still. I was confident that it would not take long for the valley breeze to kick in. At 11:30am the windsock finally came alive – a clear sign that it was time to launch because the thermals above the hills were sucking in air from the valley below. Projected thermal strength of 1.5 m/s to 2 m/s (3 to 4 kts). I was number three on the start list and airborne by 11:44AM. Once again I asked to be towed to the trusted release point near Karlspitz at 1,800m MSL (6,000 feet), around 1,100m (3,300 feet) above the valley floor, where I released in the first lift above the ridge seven minutes later. Thermal height projected at 2,400 – 3,000m (8,000 – 10,000 feet) within my soaring area – gradually improving from east to west. Unable to climb from my release point at less than 300 feet above the ridge I thought I might have released a tad too early when a thermal above the nearby hill Zachenschöberl lifted me to cloud base at 2,400m MSL (8,000 feet). My average climb rate was 1.5m/s (3kts) – not bad considering that the day had only just started. The local Alptherm forecast projected weak (“schwach”) climb rates of only 1 – 1.5 m/s (2-3 kts) for most of my soaring area. I had set a tentative turn point 126km further west above Pass Thurn. To get there, I would have to first fly along a mountain chain called the “Schladminger Tauern”, followed by the “Radstädter Tauern”, and eventually the Hohe Tauern. The first reasonably strong climb that allowed me to take out my camera came after two hours into my flight – above the peak of Bernkogel – west of the village Dorfgastein (in the valley below). Note the steep switchbacks of the hiking trail on the face of the mountain. Climbing is so much easier in a glider! The peaks of the Schladminger Tauern and the Radstädter Tauern top out at about 2,850m (9,500 feet). The ridge lines along the foothills are typically about 1,800 to 2,400m high (6,000 – 8,000 feet). Every 5-8 km or so I would have to cross one of these ridges. A cloud base of 2,400m did not leave a lot of wiggle room: I would have to climb to cloud base above a ridge line, glide through sink to the next ridge, hopefully arrive there with a decent safety margin, find a climb that would take me back to cloud base, fly through sink to the next ridge, and so forth. To make progress, pretty much every ridge line had to offer a climb and I would have to be able to locate it quickly once I got there. Should a ridge not work upon arrival, I would have to follow it towards the main valley (perpendicular to my intended route) and look for climbs along the way. Should I find myself unable to work my way back up, I would eventually have to land at one of the few land-out fields in the main valley. The cloud bases lifted to 3,300m (11,000 feet) by mid-afternoon – still well below some of the highest peaks of the Austrian Alps. Eventually I would get to the “Hohe Tauern”, which were much taller with peaks around 3,600m (12,000 feet). Low hanging clouds, tall mountains, and soaring don’t mix very well; therefore, I planned to cross the Salzach Valley around Zell am See to the north side and then continue along the lower Kitzbühler Alpen, which top out around 2,500m (8,300 feet) until I would get to my turn point. From there I would retrace my route back towards the east, continuing on to a second turn point at Admonterhütte near the town of Admont and then return back to Karlspitz for a total task distance of 325km. That was the plan. As I headed out on task I observed a seemingly endless line of clouds along the south side of the Alps, just as Skysight had predicted. On the north side, where I was flying, small but pretty cumuli started to form right above almost every ridge line. Circling in nice lift late afternoon when conditions were great and soaring was easy. You can see the dense line of clouds in the background on the far (i.e. southern) side of the mountain range. These clouds prohibited a crossing of the Alps to the south and did not dissolve until late in the day. My first ridge to cross would be near the peak of Gumpeneck, 2,226m tall. I had hoped to arrive just at the level of the peak, high enough to connect with the thermal breaking off the mountain. However, when I got there I was down at 2,080 meters, just a little too low to get into lift. That meant plan B: follow the ridge out towards the Enns Valley. Only one kilometer later I found weak lift above the ridge, worked my way up to to 2,300m, flew back to the Gumpeneck, and climbed back to cloud base at 2,370m. On to the next ridge! I arrived 130m AGL (400 feet) above the next ridge and quickly found the next climb, which took me from 2,200 to 2,570m. Great! The cloud bases were getting higher. Onwards! The next ridge was 2,200m high. I arrived there 300 feet above ground, following along the ridge for about 2 kilometers but did not find a climb. Time for plan B again: change direction, and fly above the next lower ridge line out towards the Enns Valley. 50 meters AGL I found the next climb, taking me from 2,150m back to cloud base at 2,480m. Time to push west again! Cockpit view of the LS4. Cruising at 150 kph only became an option by mid-afternoon when the cloud bases were well above the ridges. Earlier in the day I was scratching along from one ridge to the next at 110-120 kph. The next two ridges were good enough to maintain altitude but provided no climb. I was only 1 kilometer north of a peak that was 2,450m tall – too high. The lift was probably above the peak but I was down at 2,350m and couldn’t get there. So I continued on. The next ridge was slightly lower at 2,150m. I got there 100m AGL and found a nice climb back to cloud base at 2,580m. This is how my flight towards Zell am See continued. I found climbs to cloud base above each of the next three ridges, then skipped a ridge and had no choice but to take the next climb back to 2,500m even though the climb rate was dismal. A fun way of soaring but mentally very demanding. And so slow! The mountain chain in the center is Hochkönig. On the back side is the city of Berchtesgaden in Germany. Then came the next ridge and finally some reprieve: my first 2 m/s (4kt) climb of the day took me to a new high: I was at almost 2,900m! The airport of Zell am See was now within easy glide range and I could relax a bit. But I was already 90 minutes on task and had only covered just a bit over 50km! I continued to push on and the flying finally got faster and easier. Climb rates continued to improve and the cloud bases increased further. The additional altitude gave me room to increase my inter-thermal cruise speed from 120 kph to 140 kph. Above Bernkogel I averaged 2.5 m/s and climbed to 3,050m. Oh what luxury! Finally I had time to look ahead towards TP1. At least in theory there were two ways to get there: 1) continue on the south side of the Salzach Valley and cross to the north side near TP1; or, 2) cross to the north side near Zell am See (as I had initially planned) and then continue along the Kitzbuühler Alpen. The southern route looked very challenging: the mountains to my left were intimidating: the peaks towered high above my glider and were well above cloud base. The ridge lines ahead were short and provided few options to find good climbs. There was still some wind from the south and I dreaded the prospect of flying in the lee of these monsters. Unfortunately, the northern route did not look very promising either. The sky in that direction was mostly blue and the cloud bases were much lower. Crossing over to the north looked straightforward but would I be successful in crossing back south? I didn’t know. The town of Zell am See is below in front of the lake (Zeller See). You can spot the runway of the local airport in the foreground on the right – like Niederöblarn one of the most popular and most scenic glider ports in the Austrian Alps. The hills on the left side are part of the Kitzbühler Alpen – the cumuli on that side were few and far between and the cloud bases lower. For a while I contemplated my options. The airport of Zell am See – one of the premier soaring sites in Austria – was right below and provided an easy and safe landing option in case my adventure to the north side did not work out. However, I could not see any other gliders around, which caused some doubt in my mind regarding the conditions on the south side. Also, it had already taken me more than two hours to get here and I didn’t know how long it would take to get back. It was 2:15PM and Skysight had predicted thermal activity to weaken considerably as early as 4PM. Ultimately, the doubtful voices prevailed. I decided to abandon my task and turn around. In hindsight, my concerns were probably overblown. Conditions continued to improve. I averaged almost 3 m/s on my next climb and reached 3,150m. Finally I was able to skip some ridges if the attainable climb rates did not reach my expectations. My average speed, which had only been 56 kph on my outbound leg, improved to 78 kph on my next leg. Another amazing look into the steep and narrow valleys of the Hohe Tauern (High Tauern) – Austria’s tallest mountain range. Once I was back within final glide range to my start airport in Niederöblarn I reversed course again to head back west to see if I could further improve my average speed. Indeed: on my second westbound leg that took me back to Zell am See again I averaged 82 kph. I briefly thought about continuing to TP1 now as the Kitzbühler Alpen looked considerably improved, but it was almost 4PM and prudent caution won again. And another look at Zell am See at the foot of the high peaks on the opposite side of the Salzach Valley. I had not anticipated that things would get better still until thermal strength peaked around 4:30PM. On my second eastbound leg I averaged 105kph. I started to wonder if I could even score for the OLC Speed League despite the excruciatingly slow start. Around 5PM, however, it quickly became obvious that the day was coming to an end. I crossed the Enns Valley, found another climb over the Grimming and added a sightseeing flight along the Northern Limestone Range. I had hoped for a similar late-day “radiation-lift” effect from the steep south-facing cliffs as I had noticed on my prior flight on August 4. However, this time the air along the shaded cliffs just produced sink. View of the Dachstein Massif from above Planai Peak (directly below). The world cup downhill ski racers start at the top of the mountain that can be seen in the bottom left corner of the picture. This downhill track was long the fastest in the world. Near Dachstein I crossed the valley again and found the day’s last thermal over Planai Peak, famous for world-cup ski racing. From there I followed the ridge lines, which had become completely still, back to the airport in Niederöblarn for one of my smoothest touch-downs ever in completely calm conditions just before 6PM. View towards the west as the clouds started to dissolve in late afternoon. Total flight distance 392km. Average Speed, unsurprisingly slow, at 68.5 kph. The flight track is here. Flying low is (mentally) demanding. The work load is dramatically higher when you have no choice but to fly low. Having a plan A (where to go for lift), a plan B (where to go if lift does not materialize), and a plan C (where to escape to – if necessary to land – if plan B does not work) is critical. And what your plan A, B, and C ought to be changes constantly. I.e., every few minutes you may need to formulate a new plan A, B, and C. That’s a lot of work. Lift above the ridges can be very narrow. I noticed that the lift close to the ridges can sometimes be just a thin band that may be impossible to circle in. If it is wide enough to circle a steep bank angle (40-45 degrees) is often required to stay in lift – also and especially because you can’t afford to get close to minimum speed while in close proximity to the terrain. Two or three times I found myself circling with other gliders who ended up dropping out of the lift because their circles were just to wide. Always arrive above the ridges. Hopping from ridge to ridge only works if you can be sure of arriving above the next ridge line, ideally above the highest peak along the ridge for that’s where you will most likely find the next climb. If you’re not 100% certain of that, than your plan B must include a path over another (lower) ridge line that you can reach for sure above the ridge (plan B) and from where you can escape to a landable area (plan C). Always watch your airspeed as you approach a ridge. When you are approaching a ridge close to terrain you might intuitively pull back on the stick and inadvertently reduce your airspeed. Never let that happen. Flying close to terrain is dangerous and flying too slow and too close to terrain can be a fatal combination. I kept reminding myself of this throughout the flight. The combination of low cloud bases and weak lift makes you SLOW. The obvious part of this is due to the fact that you take a long time to circle in weak lift and that you have to maintain a modest airspeed even in cruise mode. Less obvious are the other delays: i) you have to take (almost) every climb simply because it is still better than plan B. ii) And if plan A does not work you may be forced to significantly detour from your intended flight route simply to find the next climb and stay aloft – as a result you end up flying many more unintended miles along the way and this is what really slows you down. Skysight has been remarkably accurate. Always read any forecast with some skepticism and never expect it to be 100% correct in every respect. However, once again Skysight was very close to reality: e.g., by mid-afternoon, climb rates were a little stronger than forecast and cloud bases a little bit higher. The most clouds were almost exactly where Skysight had predicted them to be. The start and end of the soaring day were both perhaps 30-45 minutes later than forecast. The southern side of the Enns Valley worked a bit better than forecast and the north side a little worse. But overall, Skysight was remarkably on target. Having worked with it now in different geographies and widely different conditions I believe it’s the best soaring forecast out there at the moment. The forecast had last Thursday pegged as another great soaring day in Colorado. High cloud bases (around 19-20k feet), strong thermals (up to 10+ kts), no significant risk of over-development, and nice CU clouds to mark the lift. What else could you want? Well, maybe less wind aloft. The forecast showed winds of > 20 kts from WNW – stronger to the north, a bit weaker to the south. … but windy, especially to the north (and along the Continental Divide). Since it was a weekday there was no reason to go fast to earn OLC points for the Speed-League (only flights on weekends count). Conditions were projected to be best along the lower foothills on the east side of the Divide but fairly strong across most of Colorado. With the winds being somewhat weaker to the south I felt it would be a good day to see of I could bag one or more 14ers in the Mosquito Range – a chain of mountains flanking the western edge of South Park, separating Fairplay from Leadville. There are five 14ers in the Mosquito Range: Mt. Lincoln, Mt. Cameron, Mt. Bross, Mt. Democrat, and Mt. Sherman. I decided to pick Mt. Sherman, the one located furthest to the south and therefore farthest away from Boulder, as my targeted turn-point. I thought that if I could round Mt. Sherman I might be able to also pick off one or more of the others further to the north. I also decided that it would be fun to follow up my previous pre-declared 300+ kilometer triangle with another one, and so I picked Lookout Mountain to the west of Ft. Collins as my second turn-point. Start and Finish would be at Bighorn Mountain, just east of the old mining village of Gold Hill. Bighorn Mountain is a great start location when towing to the NW from Boulder. It often produces good thermals early in the day coming off its charred south-east facing slope and it lies just within the 15km start cylinder for the Speed League. Total task distance: 325 kilometers. My forecast had the day start around 10:30AM. However, the westerly wind had produced a thin lenticular cloud on the east side of the divide and so I decided to wait until after noon to get going even though two other Boulder pilots took off (and stayed up) considerably earlier. The tow into the foothills was very choppy and characterized by significant rotor turbulence. I got a lot of slack line recovery practice. 🙂 I released at just under 10k feet MSL, higher than I had intended. Even then it was hard work to get the first decent climb. There was a lot of rotor mixed in with the thermals: my first two climbs were very rough and uneven with strong lift and strong sink mixed on every turn, requiring constant corrections. My first good climb that allowed me to gain 4,000 feet in 7 minutes came after I had struggled in middling lift for about 20 minutes following my release from tow. Funny enough it came directly off the south side of Bighorn Mountain just after I had passed through the Start Line. From my new vantage point above 16,000 feet I could now see past Mount Evans into South Park. The cumulus clouds were still few, thin and sparse but it seemed that they were developing quickly and so I felt good about getting underway towards my first turn-point. Climbs near Rollinsville and Idaho Springs – there always seems be be a thermal right over Idaho Springs – brought me close to 18,000 feet, allowing me to fly past Mount Evans into South Park. Thanks to decent climbs every 10-15 miles I continued to make good progress along the course and reached Fairplay less than an hour after leaving Bighorn Mountain. Up until this point my average speed was around 100 kph despite a cross-wind of almost 20 kts. The Mosquito Range looking south. Mt. Sherman is in the upper middle of the picture, straight above the winglet of the Discus. Mount Sherman, my targeted turn-point was about twelve miles straight ahead. But the question was: how do I get there. Just before Fairplay I started to feel the effects of the lee-side sink from the mountains in front of me. I flew directly under the last remaining cloud near Alma Junction. If I could climb back up to just under 18,000 feet I would likely be high enough to glide the last seven miles directly to the top of Mt. Sherman even if it meant pushing into sink. However, there was no lift to be had under this cloud. Despite trying to climb for about seven minutes I was only able to maintain my altitude of 15,400 feet – definitely too low to fly straight to Mt. Sherman and back. As I circled in vain I was debating between two options: 1) there was a nice looking cloud eight miles to the SE over Reinecker Ridge but that would take me much further away from my target and my distance would further increase with the wind drift. I might get back to 18,000 feet but then what? 2) there was a promising looking ridge on the NNW side of Silverheels Mountain, about five miles north. The wind seemed to be blowing right onto the ridge and the entire mountain was in the sun. If I could get a climb off that ridge I would have a much shorter distance to transition onto the top of the Mosquito Range, albeit several miles north of my target. From the perspective of reaching my target the ridge was clearly the better option. But what if it didn’t work? There were other mountains further upwind so there was a considerable risk that the ridge would be in their lee and instead of lift I might only find turbulence and sink. What would I do then? I glanced at my flight computer and confirmed what I knew anyway: my nearest decent land-out field was on the east side of Elkhorn Road, just east of Como. If the Silverheels ridge didn’t work I would escape in that direction along Little Baldy Mountain with the wind in my back. There was another cloud between Silverheels and Como. Chances were good that I would be able to find a climb there. And if not, Elkhorn Road was definitely within glide range. If it became necessary I would be able to land parallel to the road and almost directly into the wind. I estimated the risk of having to land out at less than 20% and I had a plan B and a plan C. With those thoughts in mind I decided to go for the ridge. The road between Leadville and Copper Mountain is below. The next valley behind connects Leadville with Minturn. Mount of the Holy Cross is in the distance. As expected I had to cross more sink as I pushed into the wind to get to the northern ridge of Silverheels, and when I got there my altitude had dropped to 13,600 feet – right on the ridge and just below the level of the summit. And voila, the ridge worked! Not very well, but it did. Phew! I flew a few turns in figure eight loops until I was well above the ridge line. Given that I was fairly close to terrain I also made a conscious effort to maintain extra airspeed for added safety. I was able to gain some altitude back but unfortunately the lift did not extend more than about 600 feet above the summit. Just as I was contemplating my options again I noticed a new cloud forming two miles southeast next to the summit of Little Baldy Mountain. It was in the opposite direction of where I wanted to go but it was clearly the best choice. I headed straight to the cloud, losing all the altitude I had just gained on the ridge in the process and finally I found decent lift. Eight minutes later I was back up at 17,500 feet and the world looked a lot friendlier. To my delight there were two additional new clouds between my position and the Mosquito Range so it was time for a second attempt. I pushed back into the wind and managed to get onto the Mosquito Range without losing much altitude. The route south towards Mt. Sherman did not look great but Quandary Peak, another 14er – though technically part of the Ten Mile Range and not the Mosquito Range, was just two miles to the north. It was a peak I was definitely able to reach without taking any risks so I went for it. One down. After rounding Quandary Peak I started to head back south along the ridge, glancing at my flight computer to locate the exact positions of the other 14ers between Quandary Peak and Mt. Sherman. Unfortunately I hit a lot of sink and quickly dropped back down to 15,500 feet. I wasn’t too keen on ridge soaring again so I made a quick decision to head back east under the cloud over Silverheels. The Mosquito Range and the Ten Mile Range behind looking north. Mt. Lincoln, Mt. Cameron, Mt. Democrat, and Mt. Bross are topping the two ridge lines in the upper middle right of in this picture. The road over Hoosier Pass between Fairplay and Breckenridge is visible in the upper right. Three tailings ponds from the mining industry north of Leadville are visible in the top left. Mt. Quandary is just to the right of these ponds. From Mt. Democrat I still had 8 miles to go to get to Mt Sherman. I followed the ridge line, hoping that the combination of northwesterly wind and sunshine hitting the western slope would carry me along. Unfortunately that wasn’t the case and my altitude kept dropping again. There was a nice looking cloud two miles west of the ridge (directly east of the town of Leadville) so I decided to seek another climb under that cloud before going to Mt. Sherman. That was plan A.
There’s always a risk that a cloud won’t work so having a plan B was important because I was now on the west side of the Mosquito Range and potentially unable to cross back to the east side. Fortunately, coming up with plan B was simple. With the wind from the northwest I would fly on the upwind side of the ridges to the south and eventually land at the airport in Buena Vista should I be unable to find a climb before then. I considered this a very remote possibility but felt good about knowing exactly what to do if plan A did not work. The town of Leadville is clearly visible as I circle on the west side of the Mosquito Range. There was indeed no need for plan B. The cloud east of Leadville offered a quick and easy climb to 17,800 feet. The top of Mt. Sherman was now only three miles to the southeast and more than 3,500 feet below. Rounding it felt almost anticlimactic after all the work that it took to get there: the final seven miles to get from Alma Junction to Mt. Sherman had taken me more than one hour and ten minutes! With the wind at my back and no mountain to climb in front I was back at Alma Junction in less than five minutes and on route towards Lookout Mountain, my second turn point, 100 miles NNE. There were two reasonably looking ways to get there. 1) A more direct route following the spine of the Continental Divide; and 2) A longer and more easterly route along the lower foothills via Conifer, Golden, Jamestown and Estes Park. The longer route looked a lot easier: there were several nice looking clouds between Como and Conifer and then a continuous line of – likely convergence induced – clouds all along the lower foothills to the north. I had already flown this route in similar conditions and have seen it work extremely well. The direct route had fewer compelling clouds but I thought it would benefit from the afternoon sun hitting the westerly slopes of the mountains and the northwesterly winds blowing up along the divide. And it was shorter. I opted to go for the direct route. Initially I made reasonable progress via Boreas Mountain, Geneva Peak, and Grays and Torreys Peak. But from there this choice of route turned out to be a big mistake. The further north I got the stronger the wind became. And as the wind got stronger the thermals became weaker, more turbulent, and less organized. Weak climbs meant I had to spend a long time working my way up, and while I did that, I was subjected to major wind drift. What I thought would be a shorter route, actually ended up being a longer one if you add up all the miles that I had to push back into the cross wind. The worst section was north of Longs Peak when my turn-point was no more than 20 miles away. I was just one good climb away from making my final turn point and the good climb just never came. I spent way too much time in weak wind-blown lift, hanging on to my poor route choice for no apparent reason. In retrospect, I would have been much faster had I simply departed from the divide and flown along the convergence at the base of the foothills. The last 20 miles to TP2 took me 45 minutes – a ridiculous amount of time given that I did not have a major peak to climb. After I finally rounded TP2 it took me a while to understand how easy the line along the foothills would have been. My brain was so conditioned to the poor conditions along the divide that I instinctively took the first climb I could find along the foothills, spending another 10 minutes in weak lift to work my way up to final glide altitude of 13,000 feet. Only then did I realize how easy this line could have been. I flew the next 20 miles to the Finish Line without another circle and without losing any altitude, finally reaching Bighorn Mountain five hours and three minutes after I had started my 325km task from there. Since flying was now so easy I continued for another 20 miles straight to Golden before turning around to come back to Boulder where I landed after having been in the air for six hours total. This was a difficult flight (which I made a lot more difficult than it should have been) but with some nice accomplishments: I bagged five additional Fouteeners (Quandary Peak, Mt Lincoln, Mt. Cameron, Mt. Democrat, and Mt. Sherman) and I completed my second pre-declared 300+ kilometer triangle flight (i.e. Diamond Goal). My flight track is here. If you take three attempts to round a TP and pick a poor line between two TPs something has to give: task speed only 35kts – almost twice as slow than during my first Diamond Goal flight. However, it is truly humbling when I put these accomplishments next to the flight of another Boulder pilot, Pedja Bogdanovich, on the same day: Pedja covered 1,163 kilometers including a 916km FAI triangle. His average speed: 131 kph! Pedja’s flight track is here. So much to learn! Don’t pick a high mountain top as a turn-point unless you really, really want it. Rounding Mt. Sherman took me 1 hour and 10 minutes. That is fine (and perhaps even necessary) if the primary objective of the flight is to reach that specific TP. (Would I have tried so hard to get a Fourteener had I picked Fairplay as my TP?). But if the primary goal is to complete a pre-set task, pick an easier TP and try to achieve a secondary goal (such as a nearby 14er) along the way. Don’t expect to find good thermals on the upwind side of slopes if the wind is strong. Strong wind wreaks havoc with thermals: a) the air cannot cling to the ground long enough to warm up sufficiently (hence the thermals are weaker); and b) rising thermals can be so wind-blown that it’s almost impossible to fly a full circle in lift. On very windy days the best thermals may be further downwind of mountain ranges where they are protected from the wind; – especially if the wind is forced to slow down by another airmass and a convergence line forms (like on Thursday along the foothills). If you pick a poor line, correct it (if you can). Don’t stick to a decision if it can be easily corrected. I had plenty of evidence that the line along the divide did not work and the amazing-looking cloud street along the foothills was in plain view and at all times easily reachable. I should have course-corrected when I found out that my line was clearly sub-optimal. Always have a plan B (and plan C if appropriate). I felt I was appropriately disciplined on Thursday whenever there was a risk of getting low. I did not decide to approach the Silverheels Ridge without a clear escape plan and a viable land-out spot picked. I did not cross into the Leadville Valley without having a clear plan of where to land and how to get there if needed. Don’t base your expectations on your last experience if you transition to a different area. On Thursday, I intuitively felt that the thermals along the Continental Divide would be as good as those that I had used on my outbound leg to TP1. That was a mistake. I should have anticipated that the strong wind would weaken and blow out those thermals. Likewise, my experience with the poor lift along the divide clouded my judgement with respect to the conditions when I returned to the base of the foothills at the end of the day. Different areas will likely mean different conditions – different thermal strength, different wind characteristics, etc. I have to get better taking this into account when transitioning from one area to another. The soaring forecast for this past Saturday suggested strong thermals along the lower foothills but strong westerly winds – and therefore much more difficult conditions – on the west side of the Continental Divide. Strong thermals of 3-4 m/s (6-8 kt) along the foothills from Colorado Springs in the south to the Colorado/Wyoming border in the north. Thermal height at 2PM – quite high – to be expected for the mountains but higher than usual for the plains along the foothills. Cloud bases near the legal limit of 18,000 or even higher mean that much of the flight can be high above the terrain and therefore stress-free, with a wide glide radius and therefore a wide range of landing options as long as one can stay in contact with the clouds. Modest risk of overdevelopment north of Boulder but no risk of thunderstorms. The net result presented in the PFD chart: strong thermals, a high base, and not much risk of over-development = strong attainable flight distances, especially along the lower foothills. Plus, very important to look at, especially in Boulder, is the convergence forecast. Projected convergence (and divergence) lines at 2:30PM. The chart shows several convergence zones along the lower foothills. These are super helpful especially when they are marked by curtain clouds and/or different cloud bases. In blue conditions a situation like this can be confusing for the pilot as it is not possible to see why there is lift in some areas (where air masses are coming together, i.e. converging) and sink in others (where air masses are drifting apart, i.e. diverging). Convergence forecast for 4PM. This shows a very pronounced line along the lower foothills. It is particularly useful to look at the projected development of convergence lines over the entire soaring day. (Just as it is important to look at the development of thermal height, depth, and strength). Skysight makes this easy to do by pressing on the triangle icon to the right of the time slider. Note, however, that there are so many variables at play that it is impossible to predict precisely where the convergence zones will be at any given point in time. Especially this part of the forecast can only be directional at best. However, I have found it to be extremely useful in forming a mental picture of the potential movements of air masses throughout the day. By reading the clouds it is then much easier to understand what is going on and to adjust accordingly. Given these conditions I decided I would stay on the east side of the divide and plan a pre-declared 300km triangle route that would take advantage of the strong thermal conditions along the lower foothills as well as the convergence lines. If the convergence forecast would hold and if I did my planning right, I might even be able to fly relatively fast and get some points for the OLC speed league as well. With these objectives in mind, I declared the following triangle that would meet the requirements for a Diamond Goal Flight according to the FAI. First TP at Halligan Reservoir, 103 km to the north of Gross Reservoir. According to my forecast, the convergence line would likely be a few miles east of Halligan. There were two reasons I wanted to stay on the west side: 1) the lift tends to be much weaker once you get into the more humid air mass that typically lies east of the convergence; and 2) the cloud bases on the east side are often much lower. The last thing I wanted was to be forced to descend down low just to round a turn point and then have to work my way back up. I also considered moving the TP further north but the mountains get lower the closer you get to the Wyoming border and this often means that the prevailing westerly winds tend to be stronger and therefore the thermals weaker and less organized. Second TP at Conifer, 151 km to the south of Halligan Reservoir. The projected location of the convergence was, once again, among my top reasons to pick Conifer. It also has the advantage of being less than 60 km away from Boulder, which means that given the forecasted height of the cloud base around 18,000 feet, it would be well within final glide range of the Boulder airport. I therefore considered it a stress-free turn point even if the conditions would be less than ideal. Finish back at Gross Reservoir Dam, 48 km to the north of Conifer, for a total triangle distance of 302 km (164 nautical miles). I knew, of course, that reality never exactly matches the forecast. To prove this point, as I drove to the airport in the morning, a long and wide lenticular cloud shielded the sun from reaching the ground along the foothills over a stretch of at least 100 miles. The temperature at the airfield was pleasantly cool but this only meant that without direct sunshine, thermal activity would start much later than 10:30AM as projected in the forecast. However, given that it was June 22 – just one day beyond the summer solstice – there was a lot of daytime left for the lennie to disappear and for the day to develop. Around 11:30AM the cirrus shield had become noticeably smaller and thinner and the temperature on the ground started to rise quickly. The more impatient pilots decided to launch, unfortunately only to return to the airfield 20-30 minutes later. Clearly, it was still too early. I kept telling myself that there was no reason to rush. Sunset was at 8:34PM and thermal activity would likely last until well past 6PM. And my task should not require more than 4 hours, maybe even considerably less. I decided to remain on the ground until the first pilot would stay air born. That was the case around 12:30PM. I waited for one more pilot to launch and finally took off just before 1PM. A beautiful cumulus cloud had formed right above the Flatirons – ideal for a south tow towards my start point. I stayed on tow probably a little longer than necessary and released in the second good lift at just under 10k feet MSL. My climb rate immediately improved once I was off tow – funny how that works – and within minutes I was up at 15k feet and ready to get on task. There were some nice looking cumuli right along the task line interspersed with some blue gaps in between. The first gap was perhaps the biggest at about 15 miles but I wasn’t bothered by it. I had enough altitude and the cloud ahead looked very promising. I was also within glide range of Boulder and knew that in the worst case I could try again. I also saw some developing wisps along my path and slightly adjusted my route by a few degrees here and there to take advantage of any rising air, always staying slightly on the upwind side. Beautiful skies on my first leg. The town of Estes Park is below. Longs Peak is on the left side of the picture just below the wing. I just left a very strong climb and am heading north towards Halligan Reservoir. A very powerful climb near Estes Park (up to 15 kts average!) took me to 17,000 feet and another over Signal Mountain to 17,500. The path forward to my first TP was along the convergence zone: generally the air was just rising up by 1-2 kts and I was able to fly in a straight line while maintaining altitude as long as I wasn’t pushing for speed. As I got closer to Halligan Reservoir the cloud base dropped a little so I flew a bit faster to come down as well, rounding the turn point at an altitude of 16,000 feet. Looking back to the south after my 180 turn, I noticed the convergence had continued to develop and the line was now better marked. A few miles after rounding TP1, heading south. The convergence line is clearly visible and the cloud bases ahead are rising. Horsetooth Reservoir is visible 20 miles ahead in the distance, approx. 20 degrees left of the nose. There’s a long paved private airstrip (“Christman Field”) just east of the northern tip of the lake, probably the best land-out option in this area because you could just get a tow plane instead of having to trailer back. However, with skies like this in front I was not at all worried about having to land out. West of Ft. Collins I stopped to get back to over 17,000 feet before continuing my convergence surfing: the line wasn’t completely straight so I curved gently along its west side, flying faster in sink and slowing down in lift, for the most part able to avoid any thermaling. Well-marked convergence line on my second leg, heading south. The low hanging curtain clouds mark the boundary between the different air masses. The air on the drier side (where the cloud base is significantly higher) is rising. When you see clouds like this just fly along the curtain clouds and stay on the side with the higher cloud bases. It works! You can see my detour to the west on my second and third leg as I followed the convergence. The straight line between Gross Reservoir and Conifer is the task direction. My flight path curved west via Squaw Mountain as I flew along the west side of the curtain clouds that marked the convergence. If you look closely at the slight change in color of the flight trace, you can see that I gained altitude between Gross Reservoir and Squaw Mt. on the southbound leg. At Squaw Mt. I had to leave the convergence line to reach Conifer 20+ km further SE. You can also see my altitude drop (the trace line changes color from blue to turquoise) as I tug underneath the lower cloud base near Conifer. After rounding the turn point I first headed WNW instead of flying straight towards Gross Reservoir in order to follow the best available energy line. Although this meant a longer flight track it was likely still faster than going straight and stopping in (likely weaker) thermals along the way. Conifer lay about 10 miles east of the convergence requiring me to temporarily leave the air mass that had carried me so well. Once again I had to drop down to about 16,000 feet to make the turnpoint and stay clear of the clouds. After rounding Conifer, I headed right back toward the convergence line, following along a ridge towards Mt Evans where the air was slightly ascending which meant I was also to get back to the convergence without losing much altitude. Near Squaw Mountain I stopped in a thermal to top up to 17,700 ft and from there it was a straight glide to the finish line over Gross Reservoir. Steep celebratory turn over Gross Reservoir just after crossing the finish line :-). You can see the dam straight below. The red line shows my route on task. The blue line is my flight trace before and after the task portion. With my task completed, I wondered what I could add-on to enhance my OLC score. I thought it would be great if I could turn my overall flight track into into a big FAI triangle. To do that I would have to cross the Continental Divide and fly west to a point roughly perpendicular to the line between Halligan Reservoir and Conifer, and approx. in the middle of it. Kremmling, I thought, would be an ideal turnpoint to shoot for. If this worked I might be able to post a 400 km FAI triangle. The first practical question was how to get to the Divide. The straight line west from Gross Reservoir did not look promising as it meant pushing into a big blue hole against a 15-20kt headwind. There were no clouds for 20 miles and I expected a lot of sink in the lee of the mountains. Quick decision: I would return towards Mt. Evans where the convergence line had already proven to work – then I would fly north along the divide and look for a cloud street that could take me west. In trying to execute this add-on plan, the first part worked well. Within 20 minutes I was on the divide near Silver Plume Mountain. Above the Continental Divide near James Peak, looking SW towards Vail. This cloud street looked very good but it wasn’t exactly in the direction I was most interested in taking. Also, the clouds were now developing very rapidly with the first virga are already visible on the horizon. Lastly, I am still not sufficiently familiar with the land-out options in this direction so I did not seriously consider taking this route. As I continued to head north along the ridge I hit significant sink. I stopped at Mt. Flora to get back to 17,500 before a blue gap to the next cloud near Mt. Jasper. There I only found a very weak climb in turbulent conditions. Unfortunately the clouds to the west of the divide were now rapidly over-developing. As I circled around Mt. Jasper I could see more and more virga and rain showers developing in the direction I wanted to fly in and so I decided to shelf my FAI triangle plan for another day. Continuing along the divide also seemed pointless as the thermals on the ridge were weak and extremely wind-blown. The convergence over the foothills still looked promising, however, and so I headed back towards Gold Lake. With the wind from behind this was a quick transition but I still lost quite a bit of altitude flying through the lee side sink. I had been right not pushing into the wind earlier. Leaving the Continental Divide heading east. The wing points north along the Divide. Niwot Ridge, Left Hand Reservoir, and Brainard Lake are visible below. Longs Peak and Mount Meeker are clearly visible in the distance. The blue skies above are indicative of the lee side sink on this side of the mountains. A mediocre climb near Jamestown (I wondered: would I have taken this had I been trying to get somewhere?) took me back to 17,000 and a vicious rotor over the Twin Sisters (i.e. in the lee of Longs Peak) brought me to 17,500 feet. From there I tried to connect with the clouds on top of Trail Ridge Road to maybe push a little further west from there. However, by now I should have known better than to approach the Divide from the lee side on such a windy day. After hitting heavy sink I scrapped that plan as well and headed back to the tried and true convergence line north of Estes Park. By now overdevelopment set in almost everywhere around me and although the lift was still strong, the lack of sunshine in the cockpit meant I was getting cold. Estes Park viewed from Triangle Mountain around 6PM. There’s still a nice cloud street to the west of Estes Park but it is too late for new adventures on the other side of the divide. Also, the amount of virga and rain showers is rapidly increasing at this time. With 6pm approaching the next decision was simple: enough for the day. I started my final glide north of Estes Park, flew straight to Golden and from there back to Boulder where I arrived with plenty of altitude to spare. My total flight distance ended up being 523km. My bonus goal of earning OLC Speed League points for our club worked out too. With 118 points I scored second for SSB this past weekend and first among those flying from Boulder. The flight track is here. Evening scenery at the Boulder airfield after a great day of flying. Careful task planning can pay off. Usually a pre-declared route should mean a lower average speed than simply following the best visible lines. However, by carefully planning my task in accordance with the thermal and convergence forecast I was able to pre-plan the flight in a way that took advantage of the best projected energy lines. And since the reality was not very far off from the forecast, requiring only a deviation of about 20 miles or so, I was able to complete the task as quickly as I did. Flying with a specific goal in mind greatly focuses in-flight decision making. On previous flights when I took off without a specific objective in mind, the choices were endless. This meant I often took a while to make up my mind and I also found myself reversing decisions I had made simply because small changes in the sky momentarily made some other direction look more promising. This Saturday I had a clear goal and all my decision were made to safely get to the goal as fast as possible. The difference this makes to the thought process is amazing. At any given point there are much fewer choices available and I’ve found myself homing in on those choices much faster. Flying with a specific goal makes soaring even more fun. Sure, even without a goal it is fun to take advantage of the wind and the sun and enjoy the amazing sight-seeing that can be had high above the Rocky Mountains with all of Colorado spread-out below. However, I’ve found that on days when staying up is super easy the level of fun increases to another level by adding some additional challenge and being able to measure progress against that challenge. Try it out! Convergence lines can be the key to flying fast – especially in this area where they are a very frequent phenomenon. Even if the lift along the convergence is only 1-2 kts it basically means you can fly in a straight line (maybe with slight route deviations here and there) without having to stop to thermal. You are much faster overall when floating along at 60 kts IAS at 17,000 feet than to push 80 – 90kts between thermals, then stopping to climb before putting the nose down again. Always remember the power of lee side sink. I made the right call when I decided to transition to the divide from Gross Reservoir via an established convergence line towards Mount Evans. Flying there directly into the wind would have likely been impossible. I should have remembered this lesson when I tried it again a bit later over Estes Park. Although the distance to bridge was much shorter flying in heavy lee-side sink against the wind requires a lot of excess altitude. This past Thursday was likely going to be the best soaring day of the week. Still, I wasn’t sure whether it would be a great day or merely a good day. SkySight predicted a strong thermal flying day with attainable flight distances from Boulder between 500-600k for 18m ships (which have a somewhat better performance than our club’s Standard Class 15m Discus). Note that going east from Boulder into the dark red colored area is not practical since most of that area is part of restricted Denver Class B airspace. Topmeteo was a lot more bullish and predecited outstanding soaring conditions for almost all of Colorado with potential flight distances of up to 1000 km. Thermal height was going to increase throughout the day to approx. 20,000 feet MSL over the mountains with the highest cloud bases to the southwest. Thermals were projected to be strong with climb rates of up to 10kts or even more. There were going to be winds of 10-20kts aloft, mostly from the southwest. These winds could complicate thermal flying: increasing winds with altitude tend to distort thermals breaking off from the ground and the strongest lift is often limited to upper-level convection, i.e. close to cloud-base. In addition, it is important to be careful on the lee side of taller mountains where such winds tend to cause significant sink and rotor turbulence. There was a good chance for cumulus clouds and a low risk for overdevelopment. From the soundings it looked like the day might start as early as 10AM over the foothills and significantly later in Boulder – a common scenario due to the morning inversion down in the valley. As I did the pre-flight checks on the Discus there was a slight easterly breeze on the ground – also a very common phenomenon – and an indication that there was likely a convergence line somewhere over the foothills where the easterly wind from the plains meets the westerly airflow aloft. SkySight illustrates the convergence line running along the foothills (shown in dark red): this is where the eastern airmass from the plains meets the dryer western air mass spilling over the Continental Divide. Note that this forecast is for 1:30 PM MDT. The position of the convergence line tends to shift throughout the day – often it moves further west as the day progresses. I speculated about the reasons for this in my previous post. When I launched at 10:42AM MDT the air above Boulder was still as calm as it could possibly be – a sign that the inversion still suppressed any thermal activity over the plains. The first time the air started to stir just a little was after the towplane had turned west over the foothills (west of Altona). However, the climb rate on tow remained constant until we had climbed to 10,800 feet over Jamestown and I decided that I was now high enough to push further west on my own as we still had not reached a thermal. Flight path on tow shown in dark gray. Flight path off tow shown in light blue. Release point over Jamestown. My first attempt to climb off tow was on the east side of the convergence line. Lift was weak and uneven. A few miles further west everything changed and climbing from 10,000 to 16,000 feet was almost effortless. I headed straight toward a cloud a few miles further west. East of Hidden Lake I reached the east side of the cloud and found some weak lift. I tried to climb in it but the air was rough and the lift weak and inconsistent. The wind drift was from the SE towards the NW. These were all indicators that I had reached the convergence line but that I was still on the east side. After several turns (probably too many) I decided to push to the western edge of the cloud. And voila, just as I had hoped, I had reached the west side of the convergence line and within 10 minutes I climbed from 10,000 feet to just under 16,000 feet. As I started to head south I could easily see the position of the convergence line by looking at the curtain clouds underneath the next cloud in front of me. The curtain clouds in this picture are a perfect indicator for the position of the convergence line. Good climbs can be found on the west (dry) side. The nice clouds further south (on the right hand side of the picture) suggest a quick and easy flight route ahead. My position in this picture is a few miles north of Ward above the Peak-to-Peak Highway, looking SSE. The city of Boulder is on the left edge of the picture. Two quick climbs above Nederland and south of Idaho Springs took me up to 17,000 feet – high enough to push through the potential sink on the lee side of Mount Evans. The air above Evans was rough but I found two reasonable climbs southwest of Mount Bierstadt that gave me the altitude needed to fly further southwest into Southpark where I saw some promising clouds north of Como. At this point my goal was Buena Vista and – if all went well – perhaps Salida. I climbed in ok-ish lift near Fairplay and headed for some nice looking clouds near Antero Junction. However, none of the clouds along the western rim of South Park worked well at all. I could not make out a good reason for this but when the fourth or fifth cloud provided only mediocre lift I decided to change course and save Salida as a goal for another day. A few miles to the north I saw several nice clouds right through the middle of South Park, spread about 10 miles apart. These worked and within 20 minutes or so I had reached the east rim of South Park. This area worked particularly well: it was now early afternoon and the combination of wind and sunshine from SSW provided for great lift above the SW facing slopes on the east side of South Park. At this point I had my eye on Pikes Peak. There was a blue hole right around the mountain but it was not nearly as big as during my prior attempt. Pikes Peak approx. 10 miles away and – somewhat surprisingly – free of any clouds. At the point of this picture I was above 17,500 feet and the summit at 14,114 feet seemed within easy reach. However, it wasn’t going to be that easy. The wind was blowing at 18 kts from SSW so I decided not to fly straight toward the mountain but instead to pass it on the west side and then approach it from the SW. If I wouldn’t find any lift along the slope, I would have an escape route to the south towards Fremont County Airport near Cañon City, which I figured was easily reachable even flying against the wind. There were also some nice looking thermals in that direction giving me extra confidence. As I approached Pikes Peak the air turned very rough with strong sink. A few miles SW of the summit I reached a low point of around 14,500 feet – just a few hundred feet higher than the mountain itself – too low for comfort to fly over the peak. Fortunately I found a turbulent thermal breaking off from the ridge line below me. Although it was extremely disorganized and caused erratic movements of my vario from +10kts to -10 kts I was able to climb to 16,700 feet – high enough not only to fly over the summit but also to reach the next cloud, which was approx. 10-15 miles further north. I was surprised to find strong sink on my approach to Pikes Peak. The climb above the ridge SW of the summit was quite rough. Also note the sudden (and non-obvious) change in wind drift from SW to WNW after I crossed the little lake below the summit. The air near big mountains can be very fickle. Having “bagged” Pikes Peak, I decided to head back towards Boulder while remaining on the lookout for worthwhile excursions. View of Pikes Peak from the West just as I was getting into strong unexpected sink during the approach. The climb that took me back up over the top was just above the ridge line near the little lake on the right edge of this picture. The clouds in front of me looked solid. However, when I got to the nearest one, north of Woodland Park, the climb rate was disappointing. I wondered if I was too far east – perhaps the air from the prairie had penetrated over the foothills, suppressing thermal activity? I decided to turn west again towards the east rim of South Park where I had experienced much stronger climb rates some 40 minutes ago. However, my next three thermals were equally poor and each time I decided to push on without gaining much altitude. Lee-side sink north of Buffalo Peak caused me to loose another 1,500 feet. I was now below 13,000 and worried that I might lose my connection to the clouds. Just as my mind was working on fall-back options: Perry Park airfield was still within reach (though barely) and an off-landing field near Roxborough Park (which I recently checked out on the ground) was more easily accessible, I found a modest climb southeast of Bailey. When you’re down to 12,700 feet over unforgiving terrain and with another 50 miles to go to Boulder you can’t be picky. I carefully centered the thermal and happily spent the next 12 minutes climbing back up to 17,500 feet. A succession of frustratingly weak climbs led me to a low point of 12,700 feet SE of Bailey. Perry Park Airfield was 30 miles away (requiring a 35:1 glide ratio). The nearest comfortable out-landing field was just over 20 miles away, NE of Roxborough Park. It only takes one climb for the world to look totally different again. I steered to the SW side of Mount Logan (just SE of Mt Evans), climbed again to just under 18,000 and decided to fly north. Maybe I would find lift above the Continental Divide so I could extend the flight to the north towards the Wyoming Border? However, when I got to the Divide near Mt. Eva the route to the north along the Divide did not look promising. Rain showers and virga obscured the sight and the area appeared over-developed. To my left however, there was a nice-looking cloud street towards the SW. I followed this line until Berthoud Falls when the route ahead also seemed be over-developing. I made a 180 degree turn. Looking north from my new vantage point I could suddenly see what was going on: the convergence line that had sat over the foothills in the morning had crossed over the Continental Divide. What had looked like rain showers and virga when viewed from the East side were in fact curtain clouds marking the position of the convergence line. Further to the west the sky was completely blue. Beautiful view of the convergence line on the west side of the Continental Divide. I took this picture after my northern turn-around point. The curtain clouds marking the convergence are clearly visible. I decided to follow this line to the north, always staying to the west of the curtain clouds. It worked amazingly well. I followed the line of curtain clouds that paralleled the divide. Flying between 80 and 100 kts IAS I was able to maintain my altitude of around 17,500 feet over a distance of 38 miles in just 16 minutes. The power of a convergence line: 38 miles in 16 minutes, that’s an average ground speed of 142 mph. Without losing altitude. North of Longs Peak the line became less clearly defined and the cloud base dropped so I decided to turn around. I followed the line south past Apache Peak and then decided to return towards Boulder. Grand Lake and Lake Granby viewed from the west side of the Continental Divide near Longs Peak. My final glide took me past Gross Reservoir towards Golden where I checked out the model plane airfield near Arvada from the air. I recently visited this field on the ground and determined for myself that its perfectly paved 700 foot runway is a viable out-landing option (land on the N side of the runway to minimize the risk of hitting a fence and watch out for the power lines on final). From there I followed the ridge line of the Flatirons on my way back to Boulder. The winds at Boulder airport were 3 kts from the NE. I briefly considered landing on G26 but ultimately opted for Runway G8. I’m glad I did: as soon as I climbed out of the cockpit to get the dolly a freakish 27mph gust hit the airfield straight from the east. The gust lasted for about 2-3 minutes, then total calmness returned. I have absolutely no explanation for this gust. I just know that landing with a 27 mph tailwind would have been quite troublesome. It was an interesting end to a challenging and rewarding first 500km flight. The full flight track is here. If there is a convergence over the foothills get to the west side before you are too low. This is especially true in mornings with strong ground inversions when there are still no viable thermals on the east side. Always have a viable landing field in mind. I caught myself a bit by surprise when I was down at 12,700 feet and noticed that getting to Perry Park would have been doable but already a bit of a stretch.